At Deckstainhelp.com, we take pride in the fact that we are your trusted go-to site for all things exterior wood and deck restoration related. Hearing from our customers who have used TWP 100 Series wood, their decks have held up to the test of time and weather surprisingly well after this harsh winter. As always, we appreciate your input, so feel free to leave a comment below and pictures of your completed projects if you have them. Important Note: This is our 2nd Review of TWP 100 Series, Originally posted Spring 2013 but has been updated. 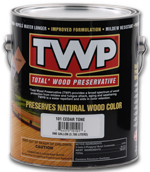 TWP 100 Total Wood Preservative Deck Stain protects and maintains all exterior wooden surfaces. 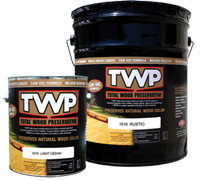 TWP Wood Stain is a special blend of chemicals in a contractor grade formula that safeguards and protects exterior wooden surfaces. TWP 100 Wood Deck Sealers lock out water and moisture that causes wood to crack, split, and warp. Freeze damage is also prevented in cold climates. 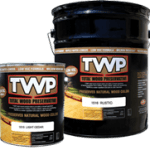 TWP Stains are the only wood and deck stains on the market that are registered as exterior wood preservatives by the EPA. – The TWP 100 Stain was applied to a very large deck surrounding a pool. The wood was about 1 year old at the time and was prepped with the Restore-A-Deck Cleaner and Brightener kit. The wood was a knotty cedar and the Cedartone 101 color gave a rich look that is typical of a cedar stain. Knots and grain were enhanced and the stain dried evenly for the 2 coats that were applied to the floor. – Same as the first time tested, The TWP Cedartone 101 retained about 80% of the original color after 2 years of weathering. – We found that the TWP did wear slightly in about 20% of the floor area. It was mostly in the high traffic areas that surrounded the pool. The upper-level deck in the back had little to no wearing.